This screen contains two options. 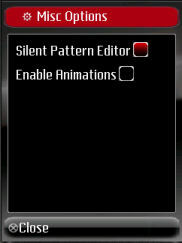 Silent Pattern Editor is used to turn on or off the audio in the pattern editor. When checked, during editing, the pattern editor plays the current pattern. Enable Animations turns screen animations on or off. Screen animations are used when navigating drum box Option screens. Some mobile phones do not display the animations very well, in these cases the animations can be turned off.